March 24th, Fly to America! March 25th to April 2nd, Stay at Holy Rosary Church, New Holstein, WI. March 25th to April 2nd, Orientation classes (3 hours per day). April 2nd to May 1st, Students stay with host family. April 4th, First day of school. May 1st, End of hosting, students are returned to the George & Pat. May 1st, Travel to Chicago, IL. 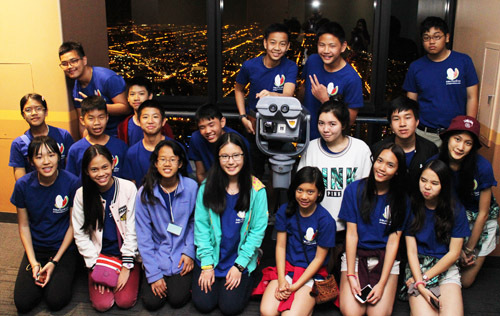 May 1st to May 3rd, Chicago Group Tour: sight-seeing, dining and shopping. May 4th, Depart Chicago. Fly to Bangkok! You must provide appropriate sleeping arrangements. All meals must be provided and paid for by the host family. Hosts receive a stipend of $250 to help cover their expenses. Host families are NOT required to do anything “special”. Internet access must be arranged so the students can blog. 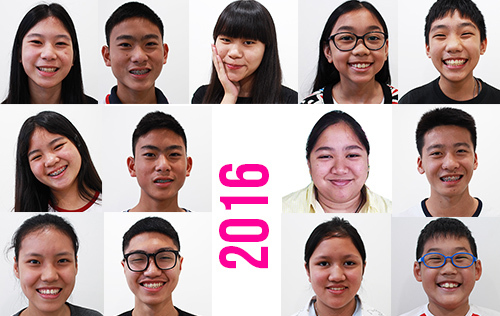 Please look at the Student Profiles 2016 and select a few students you’d like to host. Photos of the house (exterior & interior) and their bedroom, Photos of your family members including pets. All students will have documents from the Thai government permitting them to travel and a letter from their parents designating George & Panida Carroll and their hosts as guardians while in America. An English-speaking Thai assistant will be traveling with the group as well. In case of emergency, she can be contacted to assist school or healthcare officials with translation. Host parents will be given medical waivers from the Thai parents that will allow the host parent to act in their place in case of emergency (for example a visit to the hospital). Smoking & alcohol/drug use are not allowed. Students are required to respect the reasonable house-rules of their host family and follow all the rules and policies of their school. All students, regardless of age, are required to respect curfews set by their hosts. All students are required to sign a code of conduct. Any student who seriously violates this code will be sent home immediately, at their Thai parents’ expense. This decision is at the trip chaperons’ sole discretion. All students participating in the program are vaccinated. Vaccination records and guardianship documents will be given to host families & copies will be given to the schools. Health Insurance is required and all Thai students will be insured for the duration of the trip. It does not cover dental fees or eyeglasses, but it will cover medical fees (up to $100,000) and daily hospital room/board (up to $2000). Coverage provided by LMG-Pacific Insurance. Host families will make the necessary arrangements to transport the guest student to and from school each day. All planned activities such as camping & out-of-state trips must be approved by T. George first. School lunch should be arranged by the host family prior to the Thai student’s arrival. Some schools are able to add the Thai students to their meal plans, other schools require the host family to pick up the expense. Host families will provide all meals while the guest student is staying at their home. This includes meals at restaurants and other family activities. Students can use their own money to purchase snacks (at the discretion of their host parent), but they should not purchase their own meals. All school activity fees will be paid for by the host families. While Thai students are not accustomed to the ups and downs of springtime weather in Wisconsin, they have proven themselves to be very adaptable on previous trips. During the first week, they receive orientation instructions on how to dress for various weather conditions and all students will have appropriate clothing and jackets for the climate. Books, games, cameras, notebooks, and other personal items. Other basic necessities (such as bedding, soap) provided by the host family. Students can talk with their parents via various online networking tools, but the blog should be the primary method so chaperons can spot developing problems and assist the families & students. While reasonable restrictions on phone/internet usage are expected, students must be allowed to contact their family as needed. However, excessive time on the phone/internet may be a sign of homesickness and should be addressed as such (consult chaperons if this occurs). We recommend “kitchen table computing” in public areas of the home (rather than bedrooms) as a way for hosts to monitor and control internet usage. You must provide appropriate sleeping arrangements. (Their own room or a shared room with a same-gender/similar-aged host sibling). 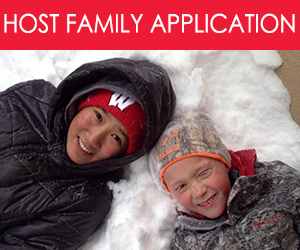 Host families are NOT required to do anything out of the ordinary (trips, gifts, tutoring, food, etc…). The Thai students should experience a normal American lifestyle, and should be treated as one of the family. They are expected to adapt to the routine of your home. Most “problems” are actually a valued part of this trip. Culture shock can be a key motivator for improving skills & confidence. So hosts & teachers should encourage their guest to persevere. The primary concern of the chaperons is student safety. “Happiness” is not a responsibility of chaperons or hosts. Some students may struggle to adapt and so teachers & parents must have realistic expectations about these things. 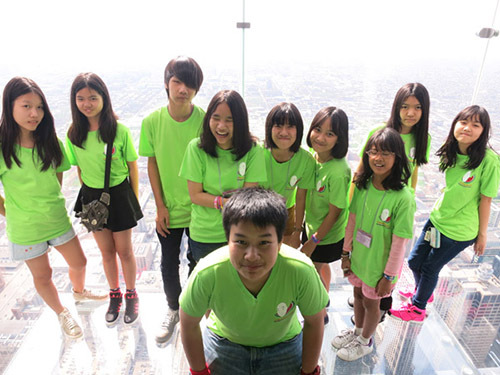 For minor problems host parents can consult with the trip chaperons for advice. In these cases, removal from the hosts’ home should be considered a last resort only after all other options have been exhausted. The school will assign a “buddy” (most likely a host sibling), and the Thai student will shadow their buddy’s class schedule. Students are expected to be attentive in class, and they should not create a burden for teachers. Many teachers have asked the Thai students to do presentations about Thai culture, therefore we require all students to prepare something prior to departure. We’ve received very positive feedback from the teachers involved in this program.